A molecule of citric acid. Definitely not an alkali. Let’s start here: lemons are acidic. Why are they acidic? They contain citric acid, about 5% by weight. Citric acid has the chemical formula C6H8O7, and the catchy systematic name of 2-hydroxypropane-1,2,3-tricarboxylic acid. If you look at the molecule you can see why it’s an acid. See those OH’s that are sitting next to =O’s? Those are acid groups. There are three of them. This is most definitely an acid. Why do they make it an acid? Or rather, what is an acid? Well there is a bit more to this than I’m about to explain (interested parties could read about Lewis acids) but essentially acids are substances that can release H+ ions (‘hydrogen ions’) when they’re dissolved in water. Those three acid groups in citric acid can, in theory, release three H+ ions per molecule. So you might expect that citric acid is a pretty strong acid. In fact, it’s not. It’s actually what chemists call a weak acid, because although it can release three hydrogen ions per molecule it doesn’t really want to that much. It’s a stingy old Scrooge and likes to keep hold of them. But that doesn’t make it somehow not an acid, it still is one. The pH of lemon juice is about 2. Which brings me to pH. It’s possibly the most abused and misunderstood scale ever. (There are two wonderful blog posts on that very subject, written by Marc Leger, which you really should read, obviously after you’ve finished here.) I’ve even found a school text book, yes honestly a school text book, that said “no one really knows what pH stands for”. Er. What? Chemists know what it stands for thank you very much (I suspect, or at least hope, that the author of that book was not a chemist). The H stands for, guess what? Yes, the amount of hydrogen ions. The p is a symbol chemists use as shorthand for ‘negative log10‘ (it’s p because it comes from the German word for potency or power, potenz, and this might be why some books claim that pH stands for ‘potential hydrogen’, which it doesn’t really). Log refers to logarithms. I’m not going to explain those in depth here – if you want to know more, this page has a clear explanation – but you will have come across other log scales. Probably the best-known is the one used to describe earthquakes: the Richter scale. Basically when you go up by a factor of 1 on the scale, it’s actually a power of 10. A major would-seriously-damage-buildings earthquake that measures 7 on the Richter scale is 1000 times more powerful than a light crockery-rattling quake that only measures 4. The pH scale is like this: every point on the scale represents ten times more (or fewer, depending on which way you’re going) hydrogen ions. Slightly counter-intuitively (but the maths works out, honest) a lower pH means more hydrogen ions. An acidic solution with a pH of 2 has 1000 times more free hydrogen ions than one with a pH of 5. 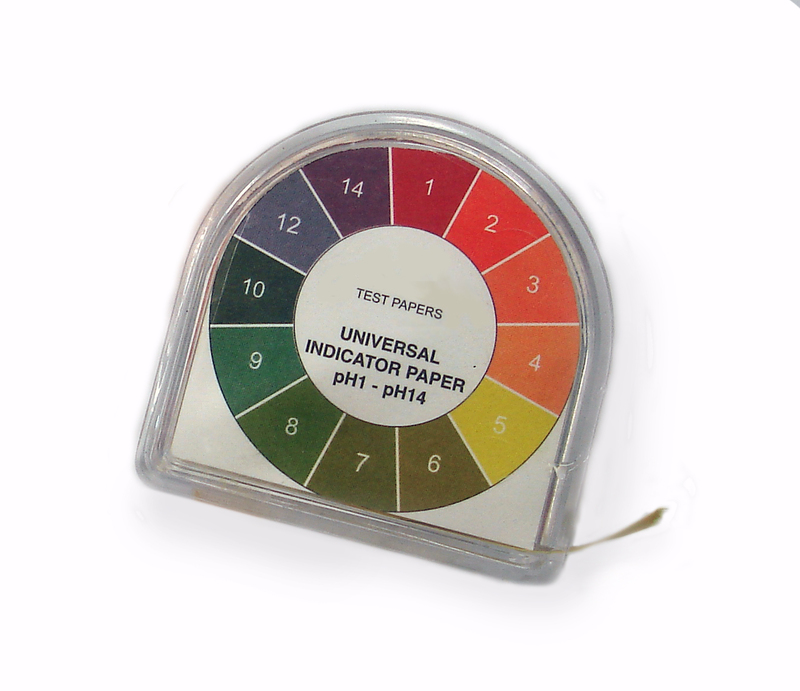 The pH scale goes from 14 down to 0, and actually negative pH values are possible as well. Values above 7 are described as alkaline (or basic), 7 itself is neutral and those below 7 are acidic. Saying that this or that acid has a pH of a specific number (like I sort of did back up there when talking about lemons, remember I started with lemons?) is a bit of a nonsense, although many authors do it. pH refers to the concentration of hydrogen ions. You could get some hydrochloric acid (the stuff in your stomach) and dilute it, and its pH would actually go up. Really. If you drop a bit of lemon juice in a big glass of water its pH would be closer to neutral (pH 7) than 2. If you think about it you know this: drink neat lemon juice and you’re puckering up your lips in a classic ‘sour’ face. Drink some water with a bit of lemon in and you barely notice it. Phew. Ok. Back to the frankly silly statement that lemons neutralise acid. 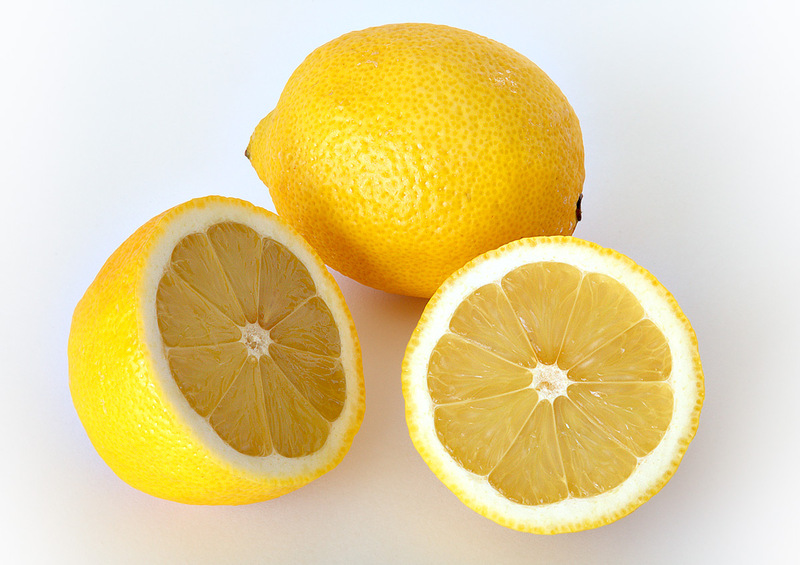 We’ve established that lemons contain citric acid, and although citric acid is a weak acid, it still is an acid. It produces hydrogen ions when you put it in water, and for that reason the pH of lemon juice – as it comes out of the lemon – is about 2. Look, that’s water on the right hand side of that slightly-wonky arrow. Pure water has a neutral pH of 7. If you add exactly enough hydroxide ions to join up with all the hydrogen ions, you get water (and a salt, because there will have been some other stuff in there as well). Once you get this far, it becomes fairly obvious that adding more hydrogen ions to hydrogen ions isn’t going to neutralise anything. It’s like trying to turn your blue paint purple by adding more blue paint. If anything, adding more acid will make your solution even more acidic (although with a weak acid it may not be quite that simple, is it ever?) Again, experience bears this out. Your stomach contains hydrochloric acid, along with some other stuff, and has a pH of between 1.5 and 3.5. Fortunately your stomach is lined with special cells that protect you from this powerful stuff. Acid indigestion, something many of us have experienced at one time or another, happens (usually) when that stomach acid gets where it shouldn’t be, i.e. into your esophagus, where it burns. If you have indigestion, do you drink lemon juice? No you do not. Not unless you actively like pain, that is. No, you take an indigestion remedy. Guess what they’re made of? Yes, alkalis, or bases (and sometimes other clever ingredients as well). They really do neutralise the excess acid by way of the equation I wrote up there. And unless you have indigestion, why would you want to ‘neutralise acidity’ anyway? Stomach acid evolved for a reason. It helps to break down your food, proteins in particular, and it also keeps you safe from lots of bacteria and other nasties which usually don’t like acidic conditions. Once your stomach has done its thing the partially-digested food passes into your small intestine where it gets squirted with bile, which actually does neutralise it so it can pass through your intestines without doing any damage. Your body has this covered. There really is no need to mess with it, and in any case, you can’t really. At least, not beyond your stomach (and urine, possibly – see my comment at the end). Homeostasis insures that everything stays remarkably consistent, and good thing too. There are lots of chemical reactions going on in your body that keep you alive, whether you realise it or not. If you could actually mess with the pH of your blood (pH 7.35-7.45) you’d be in a whole heap of trouble. So can lemons neutralise acid? No. Can what you eat ‘alkalize’ your blood? (It’s terrifying just how many websites there are about this.) No. Absolutely not. Under no circumstances. If you were to eat a lot of indigestion tablets they would neutralise the acid in your stomach, but that would have no effect on your blood. Literally no effect. By all means eat a healthy diet. Fruit and vegetables are definitely good for you. Lemons contain vitamin C (yet another acid: ascorbic acid) which is a vital nutrient. Eating them will certainly do you no harm and might well do you some good. But don’t let anyone tell you they’re anything more than a healthy citrus fruit. As you can see, this post has generated a lot of comments. Some more scientific than others. In particular, a lot of them have focused on urine, and the effect lemon juice might or might not have on urine pH. My original post was not about urine, but clearly a lot of people are fascinated by the subject. Who knew? So here’s a little extra on that topic to save me repeating myself in comments. It’s well-known that chemical makeup of urine can be affected by what we eat. We’ve probably all experienced the odd effects of asparagus, or beetroot, or even sugar puffs, so the idea that certain dietary substances make their way into urine is nothing particularly new or surprising. And following from this it IS possible to affect urine pH by eating or drinking certain substances. For example, if you’re a cystitis sufferer, you might have used a sodium citrate-containing product such as Cymalon. During a cystitis attack the urine becomes more acidic. These products work by creating a buffer effect in the bladder, which means they raise the pH slightly towards neutral and, crucially, stabilise it so that it doesn’t drop again (or, indeed, rise). Lemons contain citric acid, the salt of which is citrate. So it’s possible eating a lot of lemons (or drinking a lot of lemon juice) could have a similar effect. I found a paper on this very topic. The researchers found that drinking lemon juice produced a small increase in urinary pH from about 6.7 to 6.9. So, ok, it went up a tiny bit (remember that pH 7 is neutral) but given that the error in their measurements was +/- 0.1, that’s virtually no change at all. That said, the main focus of their interest was actually treatment of kidney stones, which are, in some cases, caused by a build-up of calcium oxalate which then forms crystals. The researchers found that the lemon juice helped the body to get rid of oxalate, and they’re not the only ones to draw this conclusion. Magnesium can also help prevent kidney stone formation (magnesium-rich foods include leafy greens, nuts and seeds, oily fish and whole grains – basically all that ‘healthy diet’ stuff, funnily enough). So in summary (and I stress, I am not a medical doctor and you should take your GP’s advice over that of some blogger on the internet), if you suffer from kidney stones, lemon juice might be helpful. It certainly won’t do you any harm (well, except possibly to your tooth enamel). A generally healthy diet will also, not surprisingly, be beneficial. Lemon juice might have a very tiny effect on urine pH. However if it does, the result is only to raise the pH a tiny bit closer to pH 7 (i.e. neutral). It does not make your urine alkaline. The topic of gout has also come up. Vitamin C is known to help with gout. Lemons contain a lot of vitamin C (ascorbic acid, not to be confused with citric acid). If you’re a gout sufferer, drinking lemon juice might help. Although taking a vitamin C supplement might be even better. None of this in any way relates to the blood, or ‘the body’ in general. You cannot, absolutely cannot, affect your blood pH with your diet, and nor would you want to. Oh, and buffers seem to come up a lot too. To save time I put all of that in a separate blog post: buffers for bluffers. is post because I found myself repeatedly refuting the same arguments over and over again. One in particular is the notion that lemon juice somehow becomes alkaline once in the body, and that this is why lemons are considered ‘alkaline’. Lemon juice will certainly be neutralised during the digestive process but there is no mechanism by which it could possibly “become alkaline”. Please don’t post comments on other pages in this site to get around the fact that comments have been closed.